And the winner of the *time for presents* giveaway, drawn at random, is Paula Jarvis! 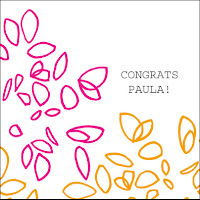 Congratulations to Paula and many thanks to all who participated. This is something I hope to do more of in the future, so please keep visiting. Suzanne, i loved your suggestion on Andrea's blog about the Live Earth concert -- it made me smile. Yip, lucky Paula...I missed this one, but I've learnt my lesson!